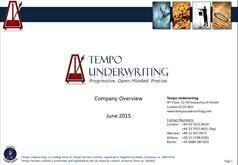 Sean is a Founder of Tempo Underwriting and is responsible for the company’s financial oversight. Sean is a chartered accountant with a specialisation in insurance restructuring and acquisitions. He has significant international experience having worked on a variety of international transactions and restructurings including the UK, the EU, Bermuda, Australia, Japan, South Korea and Singapore. This experience includes working with regulatory authorities or assisting clients in managing regulated activities in the UK and overseas. Sean is also a Founder and Executive Director of Quest Consulting which specialises in insurance and reinsurance run-off activities. Prior to founding Quest Consulting, Sean spent 15 years at Ernst & Young. Sean is a qualified Restructuring and Insolvency Practicioner (JIEB 98), a Chartered Accountant (ACA 96) and graduate of Trinity College Dublin (Engineering & Mathematics 91).